The kitchen is the focal point of the home for many families. As a pottery studio that specializes in handmade porcelain pottery ceramics many of our items are made for the kitchen. They are all offered in hand painted brushwork patterns and exquisite glazes. 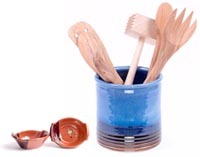 All of our handmade pottery kitchen items are microwave, dishwasher, and oven safe. We have a large collection of ever evolving kitchen accessories, all made to make your life easier. Some of our ceramic kitchen accessories that we offer are a ramekin, cream and sugar set, canister set, salt and pepper shakers, jam jar, chip and dip, trivet, teapot, honey pot, casserole, colander, berry bowl, butter dish, olive boat, and a pie plate as well as over 15 others. We have large selections of handmade porcelain bowls, dishes, pitchers and platters to serve, make and enjoy your meals with. There are mugs, goblets, teacups, tumblers, and steins to enjoy with your favorite beverages. For special occasions we have a collection of unique serving bowls that are as functional as they are beautiful. We strive to bring our customers handmade and hand painted kitchen items that are functional and attractive. We hope you enjoy our current items.